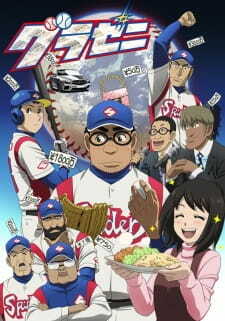 Gurazeni's first season went largely undernoticed and underappreciated, but it was a refreshing slice-of-life take on baseball with a likeable cast and very limited production qualities. With a break lasting only a single season, Gurazeni is back to...mainly do the same thing again, but ever so slightly better. Production-wise, absolutely nothing changed. It's all passable but decent at best, including the CGI used for the (quite infrequent) action cuts during the baseball games, mainly Bonda's pitching. Even more telling is the fact that both the OP and ED have been recycled from the first season, albeit with different visuals. Now both of the songs are quite nice, but it goes to show that Gurazeni doesn't exactly have any resources to spare. Anyone making it past the first season will likely not mind that too much, but don't expect improvements. That being said, story-wise Gurazeni only got better. While the first season perfectly got by with workplace slice-of-life, the second season builds on that and gives some payoff, though without any excessive fanfare or drama. Most characters from the first season make a return to build on their previous appearances, and usually they go a little deeper into the specific topic, usually regarding their future as athletes. Special notion should go to Yuki, Bonda's love interest that took up the entirety of season 1's ED despite only appearing in the final episode. This time around she's got a far larger role, and her perspective as an outsider is even cleverly used against Bonda's insider look a few times. On top of that she is cute as all hell. In truth, Gurazeni season 2 really is just more of the same. It's a realistic look at the lives of athletes operating within a giant mechanism called baseball, with specific attention towards the monetary goals of it's cogs. It's neither overly optimistic or too cynical, and ultimately gets by on the down-to-earth and likeable cast. In a landscape filled with stories in which the athletes are heroes and their sport nothing less than their life, Gurazeni is absolutely a fresh, almost unique anime. Gurazeni story line continues... (btw this anime won't give u baseball knowledge, wills, and great story. It's just about life of medium mc who is pro baseball player in Japan ). Compared to strong willed sport animes, Gurazeni is heart healing ones. Bondo injured in end of season. After 4 months fully healing he climbs back to major. Some of his teammates ends their dream like bugs. That could be harsh if art were realistic. But Gurazeni's art kinda calms me. They just shows sad ending story with very calming animations. Also in this sequel romance punch lines were really good. They really enjoyed me :3. They didn't changed op and ed's theme song. They just changed background video. That was really good choice. I really liked that. Character developments was great. New characters with well roles in this season. I can't type lot of this anime cause it's anime that you have to watch it and feel. btw really enjoyed and satisfied Gurazeni season 2. Hoping there's season 3 in 2019.